HOMEGROWN Oliver’s Market is now the largest employee-owned company in Sonoma County. Whole Foods Market may soon be owned by independent-retailer-gobbling behemoth Amazon, but Oliver's Market is going in the opposite direction. Oliver's, Sonoma County's largest independent grocer, sold 43 percent of the company to its employees through an employee stock-ownership plan (ESOP), granting a majority of its 1,000-plus employees to collectively purchase this portion of the company. Founder and president Steve Maass says he wanted to continue the legacy of the market and keep the stores independent. "It's a way of keeping a local business local," Maass says. "It has created a lot of excitement with the employees and with the community." With the announcement of the stock ownership plan earlier this month, Oliver's is now the largest employee-owned company in Sonoma County. Over 600 of its employees qualify for the stock ownership plan. The plan will provide employees with over 10 years of service full vesting of their allocated shares immediately. All eligible employees that began working at the start of the year will be fully vested for three years. Maass explained that there are no federal or state taxes involved in the plan, making it affordable to any and all employees that want to call Oliver's Market their own. "The taxes are all deferred, much like the 401(k)," Maass says. "It doesn't cost the employees anything." The company also registered as a social purpose corporation (SPC), which means the employees' welfare, the environment and the community are all considered in business decisions. "We've been a part of the community for almost 30 years," says Maass, "so we can look at that instead of just the money." Maass noted that becoming an SPC was mainly done to protect the business from selling to bigger companies. "Bigger chains certainly want to buy us," Maass says. "We're just trying to remain local and independent. I think there's very, very few independent stores left in the area." Maass began his career in retail in 1972 when he founded Maass Produce, operating roadside produce stands all around the Bay Area. He has lived in Sonoma County for over 40 years, and currently serves as a director of the Redwood Empire Food Bank. 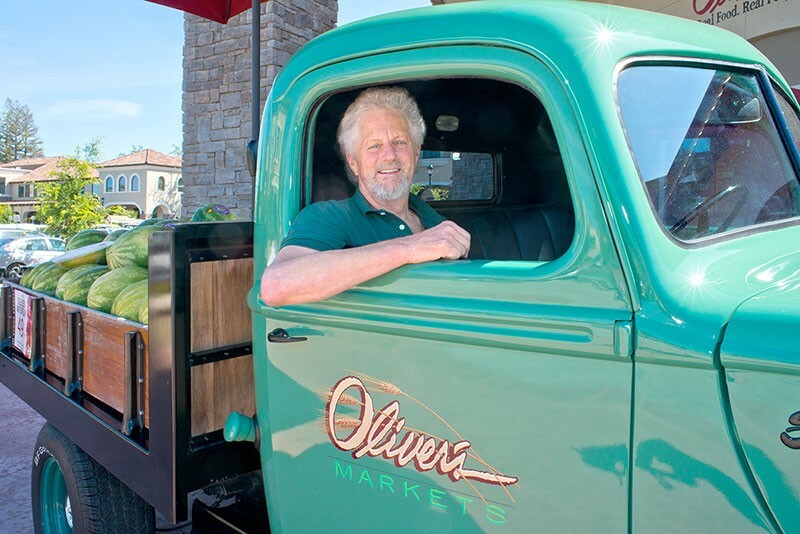 Maass founded the first Oliver's Market in Cotati in 1988 with a vision to create a store where customers truly enjoyed shopping for groceries. Oliver's is now the largest supporter of products made and grown in Sonoma County, carrying products from over 600 businesses, which account for 26 percent of the store's annual sales. Maass credits the success of Oliver's Market to the longtime managers, staff and employees who have played key roles in the company's growth over the years. "I certainly didn't build the place myself," Maass says. "Everybody here participated." Maass says his own future played a role in the decision to enact the stock ownership plan. "I'm 71 years old," he says. "I was trying to figure out how to retire—sort of." Oliver's has also been a leader in the Go Local movement in the Sonoma County region, playing an important role in creating the co-op marketing organization Go Local Sonoma County. Oliver's received a Best Practice Award from the Business Environment Alliance in 2007 and a Green Business Certification from the Sonoma County Green Business Program in 2011. Now, Maass says, "the employees own the store. I think the plan is a great thing for me, and I think it's a great thing for the employees. As long as we're successful, the plan will be successful." Local business and labor leaders praised the move by Maass. Ben Stone, executive director of the Sonoma County Economic Development Board, described the Oliver's move as "very progressive and definitely a way to reach out to the employees and let them be involved in new ways as owners of the company." North Bay labor activist Marty Bennett echoed Stone's enthusiasm, but with a caveat. "It can only be good news from labor's perspective," Bennett says. Yet he has heard from younger employees at Oliver's about some issues around uncertainty in scheduling, and that the starting pay is $13 an hour—Bennett is a huge champion of the Fight for $15. "They are better employers than many retailers," he says, "but I do not want to say that they have the highest possible labor standards." Corey Rosen is an Oakland-based expert on the ESOP phenomenon who founded the National Center for Employee Ownership, and he also gives Oliver's high marks for its employee-focused move—especially in light of Amazon's possible purchase of Whole Foods. John Mackey could have gone the ESOP route but chose not to. Companies that do make this choice are not always motivated by the bottom line, says Rosen, and usually are already highly invested in workplace development and other pro-worker programs. "In companies where owners have a choice—and Oliver's is a very good example of this—[Maass] could have sold it to all kinds of people. Most of the time the ESOP will pay a competitive price, but he could have sold it for a lot more, and instead he said, 'I have enough money and legacy matters to me.'"